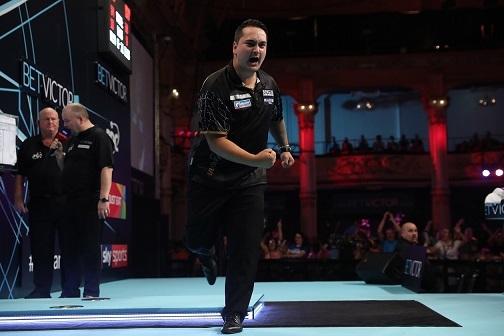 JEFFREY DE ZWAAN continued his dream debut at the BetVictor World Matchplay with an incredible 11-9 second round win over former finalist Adrian Lewis in Blackpool on Tuesday. Fresh from his shock round one win over Michael van Gerwen, De Zwaan caused another upset as he dumped out the two-time World Champion in a high-class encounter on night four of the tournament. 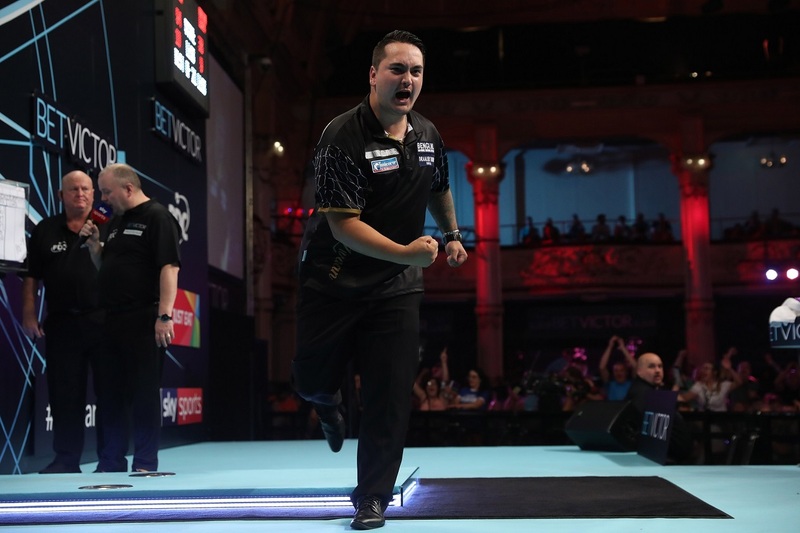 Under immense pressure from Lewis, De Zwaan held his nerve to seal victory with a showpiece double-double 94 finish as he continued his quest for the Phil Taylor Trophy. De Zwaan - who had to go to Qualifying School in January to win back his PDC Tour Card - will now play Dave Chisnall in Thursday's quarter-finals on the biggest night of his career so far. "I'm still in dreamland, I am so happy with this win," said the 22-year-old, who hit two ton-plus finishes. "I think it was a fantastic game, we both played well - Adrian is a great player so to beat him is a magnificent achievement. "Hitting the 94 to win the match felt really great, I was very happy to see it go in. "It is already a dream but I don't want it to end yet and I will give everything to beat Dave - I am scared of nobody and I just want to play like I can." Fresh from his first round heroics against top seed Van Gerwen, De Zwaan started in the same vein as he took a commanding 6-2 lead against Lewis. With De Zwaan leading 10-7, he missed three match darts at double top before Lewis stepped in to capitalise with a 49 finish and go within a leg of catching the Dutch youngster. In what turned out to be the final leg, Lewis put De Zwaan under immense pressure to level the tie, only for the youngster to hold his nerve to book his place in the last eight. Chisnall had earlier produced a sensational comeback from 7-1 down to beat Michael Smith 11-8 and book his place in the quarter-finals for a fifth time. 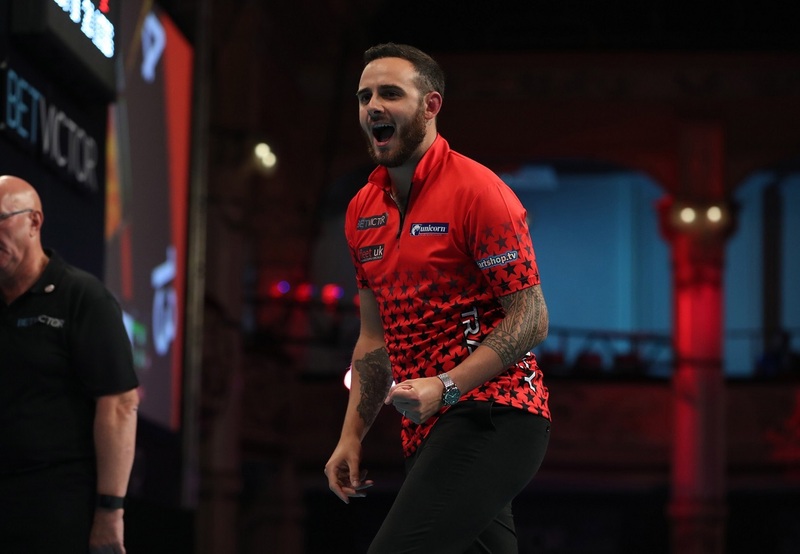 In an all-St Helens clash it was Smith who started quickest, racing into a 4-1 lead at the first break before continuing his dominance to move 7-1 up, hitting a 110 finish along the way. 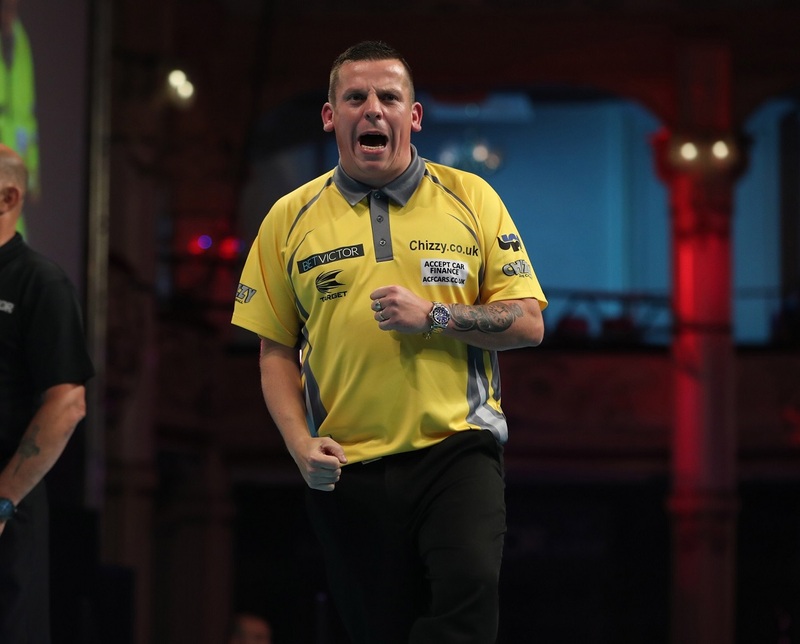 Chisnall rallied to reel off ten of the next 11 legs in spectacular style, throwing an impressive 103.02 average to stun Smith and reach the last eight of a televised ranking event for the first time in over a year-and-a-half. "It's unbelievable to win in that way," said Chisnall, who hit ten 180s and two ton-plus finishes. "I haven't played great darts for eight months and I started slowly again, and Michael took advantage. "I've had a few good comebacks before but I had nothing to lose at 7-1 and my doubles started going in. "It's nice to be in the quarter-finals but I want to push on from here. Not being in the Premier League was a kick up the backside but I've worked really hard leading up to this event and I feel good." World number four Gary Anderson came back from 5-1 down to beat Raymond van Barneveld 11-9 as he continued his quest for a maiden World Matchplay title. The two-time Winter Gardens semi-finalist threw a magnificent 104.17 average, the highest of the tournament so far, to come out on top against a determined Van Barneveld in a high quality encounter. Anderson won the match in style, taking out 82 on the bull to spark celebrations in Blackpool and he will now face Joe Cullen in the last eight. "It's not often I give it a big celebration but it felt good when I won that one," said Anderson. "When I was 5-1 behind I wasn't nervous at all, I was kicking myself that I was behind and I knew I could get back into it. "I was playing with a new set of darts tonight and they felt good. Joe will be a tough game in the next round and I'll have to be ready to start well." Cullen dumped out fifth seed Daryl Gurney with a comfortable 11-3 triumph to reach the quarter-finals of a televised event for only the second time in his career, matching his run at the 2016 UK Open. With Cullen leading 4-3 after a tight opening exchange, the Bradford man struck a crucial 95 finish to break the Gurney throw and proceeded to reel off the next six legs in impressive style. Having taken four attempts to win his first game on the Winter Gardens stage, Cullen will now be bidding to make it three in a row to reach his first ever televised ranking semi-final. "I felt comfortable, Daryl wasn't himself but my job is to capitalise on his mistakes and that's what I did," said Cullen, who is also set to move into the world's top 16 for the first time. "Any player in the world would be happy to hit half their doubles, I need to up my scoring and I will hopefully do so in the next round. "To be honest I'm disappointed that this is only my second televised ranking quarter-final, I feel I should've made a lot more but now I've got the chance to kick on now and do even better."